A Literary Odyssey: Announcing Clarissa in April: A Readalong and Sign-ups. Announcing Clarissa in April: A Readalong and Sign-ups. 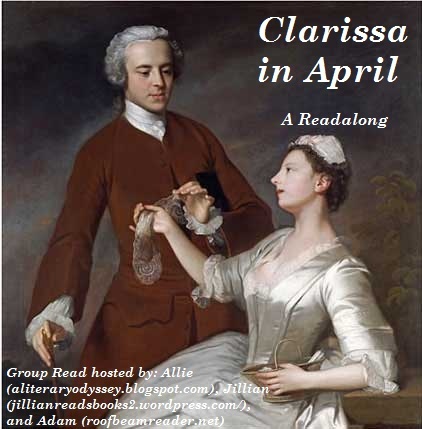 I'm happy to finally announce "Clarissa in April," a group readalong hosted by myself, Jillian, and Adam for the month of April. 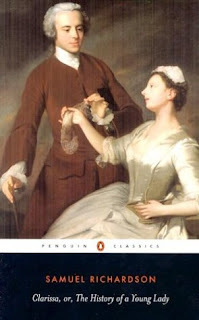 Jillian and I have been talking about Clarissa by Samuel Richardson for months, so I am glad we're finally nearing the month we decided to read it. I think we made our plans last October! We recruited Adam in our evil plan a couple months ago, so the three of us are set and primed to dive into one of the English language's longest books. At close to a million words, nothing else really comes that close to this chunky brick of a book. And what better challenge for ourselves than to dive in and read it in 30 days? You know that I'm always game for a challenge! All three of us have the Penguin paperback edition (Seen at left). Our graphic for the event, above, was taken from the cover as inspiration (the image is the 1740 painted called "Sir Edward and Lady Turner"). The book is massive at 1499 pages (1533 with notes) and pretty tiny print. When my book was shipped to me, my packing slip told me it was over 5 pounds. We want to extend an invitation to anyone who wants to join in on the fun. We're going to approach this in a very low-key manner. After talking about it, we don't want to have a posting or reading schedule, which will give us the freedom to go at our own pace and post as we wish to (If you do want a strict schedule, it works out to reading 50 pages a day, or 350 pages a week). And if 30 days is a bit too much for you, there is a year-long group read of the book taking place with Lakeside Musing and Tip of the Iceberg. That's a LOT of reading for one month! I'm actually enjoying Clarissa much more than I 'd anticipated and will look forward to your thoughts. This is craziness! Good luck with your reading, I look forward to reading your thoughts. Ooh, I'm thinking about it... I might just be crazy enough to join in. I read Pamela about a year ago and then bought Clarissa... which has sat on my shelf since then. I'd love to join in but I may be too busy since I'm still in school. I think I'm going to try reading it with you guys though since that will give me the push I need to get it started! I'm in! Gonna read it on my nook (unless this proves to be a problem for me) I can't wait! This would've been a good one to get on the Nook (even though I never use mine). My arms are getting TIRED. I have begun Clarissa and am already on volume two, but I have decided to jump ship to the year long read, as this is just too crazy for me right now. Thank you for making me pick up the book through, as it has been on my to read list for some time. Good luck with your challenge!